Maintenance of Heavy Vehicle), Machinist, and Tuner Jobs through online mode only. The candidates who are qualified in 8th/10th/ITI can apply for these Jobs. 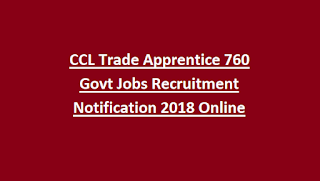 Interested and eligible candidates can apply for these jobs through the online official website of CCL Recruitment is www.apprenticeship.gov.in from 15-10-2018 onwards. The last date to submit the application forms along with the relevant documentation and the signed photograph is on or before 15-11-2018. 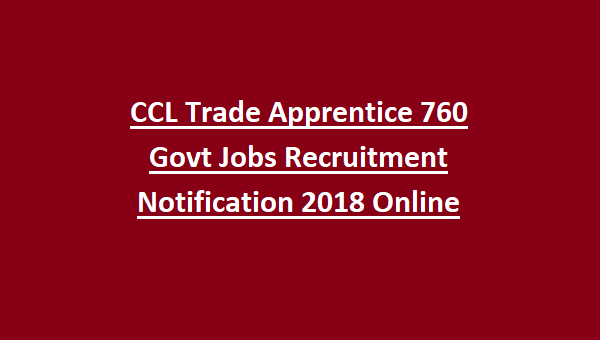 For more details of age limit, selection process and how to apply are given below for the Trade Apprentice Posts in CCL Recruitment Notification 2018. Based on Post Name wise the number of available vacancies is given below. The age limit for the candidates applying for the Trade Apprentice Posts of Fitter, Electrician, Computer Operator, and Programming Assistant Jobs is in between 18 – 30 years as on 15-11-2018. The educational qualification for the Trade Apprentice Jobs of Electrician, Fitter, Computer Operator and Programming Assistant is Candidate should have completed 8th/10th/ITI. Candidates can refer in the official notification for the PayScale details. The candidates will be shortlisted based on the merit list. The candidates who are qualified in 8th/10th/ITI can apply for these Jobs. Interested and eligible candidates can apply for these jobs through the online official website of CCL Recruitment is www.apprenticeship.gov.in from 15-10-2018 onwards. The last date to submit the application forms along with the relevant documentation and the signed photograph is on or before 15-11-2018.